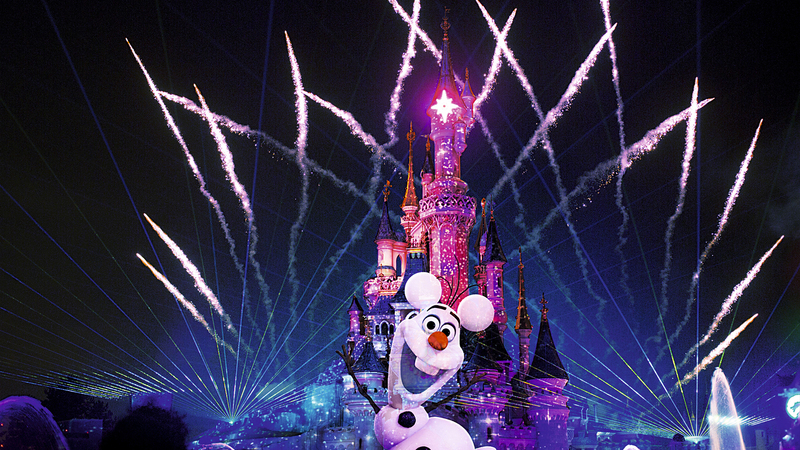 Disneyland Paris has released further information about this years Frozen themed summer festival Frozen Summer Fun. 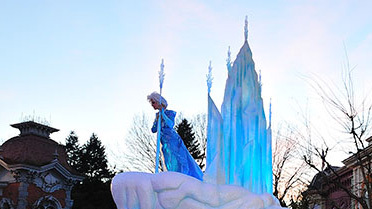 From June 1st to September 13th 2015, the magic of Frozen falls on the Disneyland Park. 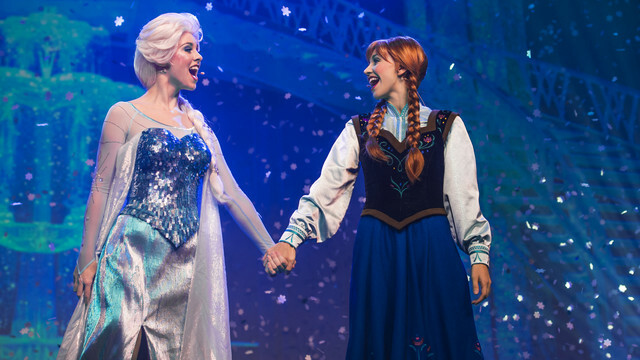 Keep your eyes peeled for Elsa and Anna as they glide around the Park in a twinkling carriage, before joining them and Olaf to sing your favourite Frozen songs in a live, interactive Frozen Sing-along that’s sure to melt your heart! Warm up your vocals for an interactive sing along you’ll never let go. Live on stage at the Chaparral Theater located in Frontierland. Elsa, Anna and Olaf will lead you through some of Frozen favourite songs, whilst more icy Frozen fun waits to be discovered just round the corner. 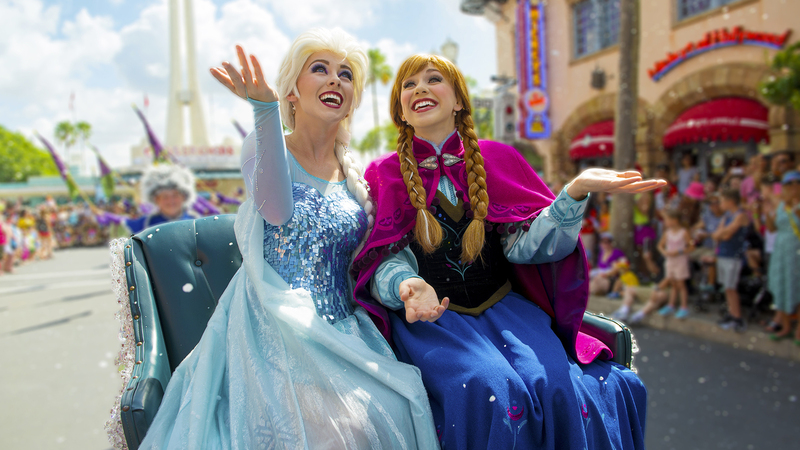 Don’t miss Frozen Characters in Disney Magic on Parade! Let it glow with Frozen in Disney Dreams! 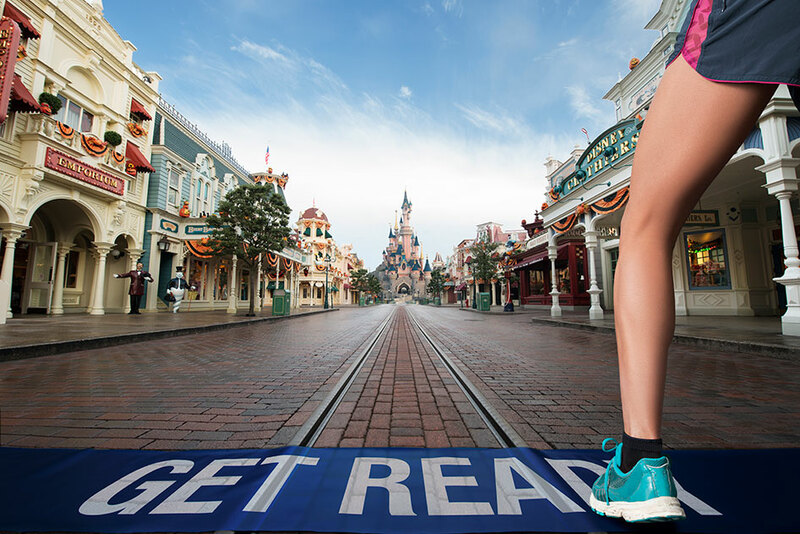 Disneyland Paris has announced it is hosting its first running weekend from 23 to 25 September 2016. Further informed about the Disneyland Paris Half-Marathon Inaugural Weekend can be found at http://run.disneylandparis.com. Euro Disney S.C.A. announces the final completion of its capital increases. This article is not for publication, release or distribution directly or indirectly in the United States of America, Canada, Australia or Japan. (Marne-la-Vallée, February 20, 2015) Euro Disney S.C.A. (the “Company”), parent company of Euro Disney Associés S.C.A., operator of Disneyland® Paris, announced today the final completion of its capital increase with shareholders’ preferential subscription rights maintained (the “Rights Offering”) and of its two capital increases without preferential subscription rights reserved for Euro Disney Investments S.A.S. (“EDI S.A.S.”) and EDL Corporation S.A.S. (“EDLC S.A.S.”), two indirect wholly-owned subsidiaries of The Walt Disney Company (the “Reserved Capital Increases”, together with the Rights Offering, the “Company’s Capital Increases”). The characteristics of the Company’s Capital Increases have been described in detail in the securities note that is part of the prospectus approved by the Autorité des marchés financiers (“AMF”) under visa number 15-021 on January 14, 2015 (the “Prospectus”). The completion of the Company’s Capital Increases occurred within the framework of the implementation of the proposal of recapitalization and debt reduction of the Euro Disney group (the “Group”) announced on October 6, 2014, which is aimed at improving the Group’s financial position and enabling it to continue investing in Disneyland Paris so as to improve the guest experience (the “Proposal”). The subscription by EDI S.A.S. and EDLC S.A.S., by way of set-off against receivables, to the Reserved Capital Increases for a total amount of €492 million (including issue premium), by issuance of 393,600,000 new ordinary shares at a price of €1.25 per share, occurred today, following implementation of the Rights Offering amounting to €350,788,410, the results of which were announced by the Company on February 17, 2015. As a result of the Company’s Capital Increases, the settlement and delivery of which is scheduled today, 744,388,410 new ordinary shares were issued and admitted to trading on Euronext Paris today. Following completion of the Company’s Capital Increases, EDL Holding Company LLC (“EDL Holding”), EDI S.A.S. and EDLC S.A.S., now own 566,675,030 Company’s shares, representing 72.34% of the Company’s share capital and voting rights. Pursuant to legal and regulatory provisions, as a consequence of the increase of their shareholding in the Company’s share capital, EDL Holding, EDI S.A.S. and EDLC S.A.S., acting in concert (the “Bidders”), will be required to initiate a tender offer on all of the Company’s shares they do not already own as of today (the “Mandatory Tender Offer”). As a consequence, BNP Paribas, acting as presenting bank, will proceed today with the filing of the Mandatory Tender Offer with the AMF, on the behalf of the Bidders. The draft offer document (projet de note d’information) prepared by the Bidders (the “Draft Offer Document”), as well as the draft response document (projet de note en réponse) prepared by the Company (the “Draft Response Document”), both of which will be filed today with the AMF in the context of the Mandatory Tender Offer, will be made available on the Group’s website. Following completion of the Mandatory Tender Offer, and in order to give the Company’s shareholders the possibility not to be diluted as a result of the Reserved Capital Increases, EDI S.A.S. and EDLC S.A.S. will offer, subject to specific conditions, to individuals or legal entities (other than EDL Holding, EDI S.A.S. and EDLC S.A.S.) having the status of Company’s shareholder at each of the three following dates (i) on the last trading day preceding the opening of the subscription period of the Rights Offering (i.e., on January 16, 2015), (ii) on the settlement and delivery date of the Company’s Capital Increases (i.e., today) and (iii) on the trading day immediately following the date of publication of the results of the Mandatory Tender Offer, the opportunity to acquire a portion of the shares subscribed by EDI S.A.S. and EDLC S.A.S. within the framework of the Reserved Capital Increases (the “Right to Acquire Company’s Shares”). The conditions for allocating and exercise of the Right to Acquire Company’s Shares are described in detail in the Prospectus. For more information on the Proposal, please refer to the press releases issued by the Company on October 6, 2014, on January 14, 2015 and on February 17, 2015 which are available on the Group’s website (http://corporate.disneylandparis.com). The Prospectus is available free of charge at the Company’s registered office, 1 rue de la Galmy – 77700 Chessy, on the above mentioned Group’s website, as well as on the AMF’s website (www.amf-france.org). The Draft Offer Document, as well as the Draft Response Document will be made available free of charge, following their respective filing today with the AMF, at the Company’s registered office, on the above mentioned Group’s website, as well as on the above mentioned AMF’s website. Euro Disney S.C.A. announces the results of its capital increase. Euro Disney S.C.A. has announced the results of its capital increase with shareholders’ preferential subscription rights maintained, carried out within the framework of the implementation of the proposal of recapitalization and debt reduction of the Euro Disney group announced on 6 October 2014. (Marne-la-Vallée, February 17, 2015) Euro Disney S.C.A. (the “Company”), parent company of Euro Disney Associés S.C.A., operator of Disneyland® Paris, announced today the results of its capital increase with shareholders’ preferential subscription rights maintained (the “Rights Offering”). The characteristics of the Rights Offering have been described in details in the securities note that is part of the prospectus approved by the Authorité des marchés financiers (“AMF”) under visa number 15-021 on January 14, 2015 (the “Prospectus”). The Rights Offering was implemented as part of the implementation of the proposal of recapitalization and debt reduction of the Euro Disney group (the “Group”) announced on October 6, 2014, which is aimed at improving the Group’s financial position and enabling it to continue investing in Disneyland Paris so as to improve the guest experience (the “Proposal”). The gross proceeds of the Rights Offering amounted to €350,788,410, corresponding to the issuance of 350,788,410 new ordinary shares of a nominal value of €1.00 each. At the end of the subscription period, which was opened from January 19, 2015 to February 6, 2015 (included), the subscription rate was 94.86%, corresponding to 332,755,740 new Company’s ordinary shares subscribed upon exercise of their preferential subscription rights by rights holders. Pursuant to its unilateral backstop undertaking, EDL Holding Company LLC (“EDL Holding”), the main shareholder of the Company and an indirect wholly-owned subsidiary of The Walt Disney Company (“TWDC”), has subscribed to all shares issued as part of the Rights Offering that were not subscribed by other holders of preferential subscription rights, on an irreducible basis, corresponding to 18,032,670 new ordinary shares. In that respect, it is specified that EDL Holding also exercised all of the preferential subscription rights attached to the 15,504,236 Company’s shares it owned on the last trading day preceding the opening of the subscription period of the Rights Offering. Therefore, EDL Holding subscribed for a total number of 157,570,794 Company’s shares within the framework of the Rights Offering. In the context of implementation of the Proposal, the Company will also carry out two capital increases reserved to Euro Disney Investments S.A.S. (“EDI S.A.S.”) and EDL Corporation S.A.S. (“EDLC S.A.S.”), which are two indirect wholly-owned subsidiaries of TWDC, for a total amount of €492 million (including issue premium), by issuance of 393,600,000 new ordinary shares at a price of €1.25 per share (the “Reserved Capital Increases”, together with the Rights Offering, the “Company’s Capital Increases”). The characteristics of these Reserved Capital Increases, which will be subscribed by EDI S.A.S. and EDLC S.A.S. on February 20, 2015, have also been detailed in the Prospectus. The settlement and delivery of the new ordinary shares issued in the context of the Rights Offering and the Reserved Capital Increases, as well as their admission to trading on Euronext Paris, will occur on February 20, 2015 (the “Settlement and Delivery Date”). Following completion of the Company’s Capital Increases and pursuant to legal and regulatory provisions, EDL Holding, EDI S.A.S. and EDLC S.A.S., acting in concert, will be required, as a consequence of the increase of their shareholding in the Company’s share capital, to initiate on the Settlement and Delivery Date a tender offer on all of the Company’s shares they will not already own on this date (the “Mandatory Tender Offer”). Following completion of the Mandatory Tender Offer, and in order to give the Company’s shareholders the possibility not to be diluted as a result of the Reserved Capital Increases, EDI S.A.S. and EDLC S.A.S. will offer, subject to specific conditions, to individuals or legal entities (other than EDL Holding, EDI S.A.S. and EDLC S.A.S.) having the status of Company’s shareholder at each of the three following dates (i) on the last trading day preceding the opening of the subscription period of the Rights Offering (i.e., on January 16, 2015), (ii) on the Settlement and Delivery Date and (iii) on the trading day immediately following the date of publication of the results of the Mandatory Tender Offer, the opportunity to acquire a portion of the shares subscribed by EDI S.A.S. and EDLC S.A.S. within the framework of the Reserved Capital Increases (the “Right to Acquire Company’s Shares”). The conditions for allocating and exercise of the Right to Acquire Company’s Shares are described in detail in the Prospectus. For more information on the Proposal, please refer to the press releases issued by the Company on October 6, 2014 and on January 14, 2015, which are available on the Group’s website (http://corporate.disneylandparis.com). The Prospectus is available free of charge at the Company’s registered office, 1 rue de la Galmy – 77700 Chessy, on the above mentionned Group’s website, as well as on the AMF’s website (www.amf-france.org). Disneyland Paris has released the schedule for this years St Davids Welsh festival which will be held at the park on 7 March 2015. The choir will perform a repertoire of traditional and popular songs including a Disney Medley created in 2014 with special participation from the Urdd Welsh National Eisteddfod. As a result of the recent bad weather conditions over the latest few weeks, the reopening of Salon Mickey has been postponed to Monday 2nd March 2015 at 9 a.m. 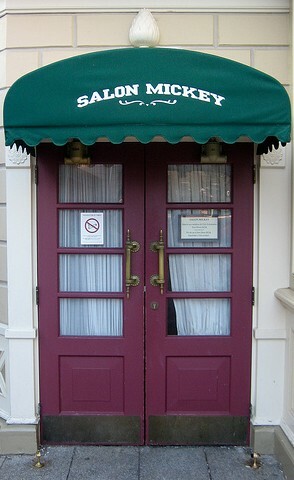 The Salon Mickey shareholders lounge has been closed since 12 January due to rehabilitation work being carried out on the paving between the Disneyland Hotel and the entrance of the Salon Mickey. Salon Mickey was was due to re-open this week on 13 February.